Western blot analysis of extracts from various cell lines using Aprataxin (D5P3C) Rabbit mAb (upper) or β-Actin (D6F6) Rabbit mAb #8457 (lower). 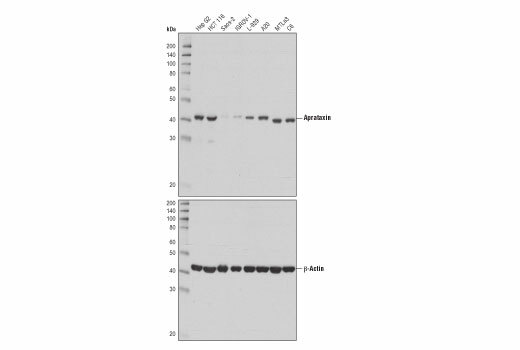 Aprataxin (D5P3C) Rabbit mAb recognizes endogenous levels of total aprataxin protein. Monoclonal antibody is produced by immunizing animals with a synthetic peptide corresponding to residues surrounding Phe282 of human aprataxin protein. Aprataxin is a DNA repair protein that resolves DNA lesions (DNA adenylates) caused by abortive ligations in single-strand break repair, double-strand break repair and base excision repair (1). Aprataxin is recruited to sites of DNA damage by PARP1 (2). In the mitochondria, aprataxin and tyrosyl-DNA-phosphodiesterase 1 (TDP1) are required for repair of single strand breaks caused primarily by reactive oxygen species (ROS) (3). The gene for aprataxin, APTX, is defective in the neurodegenerative disorder oculomotor apraxia type 1 (AOA1)(4). Researchers have shown that levels of aprataxin can predict patient response to irinotecan-based treatments in colorectal cancer (5). Rass, U. et al. (2007) J Biol Chem 282, 9469-74. Harris, J.L. et al. (2009) Hum Mol Genet 18, 4102-17. Meagher, M. and Lightowlers, R.N. (2014) Biochimie 100, 121-4. Schellenberg, M.J. et al. (2015) Prog Biophys Mol Biol 117, 157-65. Dopeso, H. et al. (2010) Clin Cancer Res 16, 2375-82.